The Turkish boatyard based in Istanbul extends its production with the launch of the new Numarine 102' RPH onto the super-yacht market. The project was recently presented at the Festival de la Plaisance in Cannes. 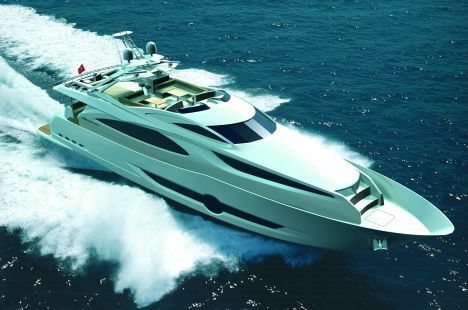 It is a yacht with an unusual design, undoubtedly futuristic, with sharp edges on the superstructure and generous windows. The hull also benefits from long, unusually shaped side windows. It is, without doubt, a yacht with a bright, well finished interior and original configuration. In fact, the main deck offers a fairly conventional subdivision, but with certain unusual furnishing aspects that are quite unconventional. It has a circular lounge from where you move onto the dining area, kitchen, daytime bathroom and owner's suite. The latter offers a double bed, bathroom with separate shower cabin and a large wardrobe. The other cabins are on the lower deck, where there are two areas separated from the engine room. The one at bow is reserved for guests, who can make use of two separate sleeping cabins with beds side by side, two double suites and four bathrooms, while the stern quarters are set aside for the crew who have three single cabins and as many bathrooms. Between the main deck and the upper one, is the steering area, made up of a full beam platform, an ergonomic armchair and small sofa with adjoining chart table. Along the flying bridge are two relaxation areas with "C" shaped sofas and cocktail tables, a bar area and sunbathing cushions, while on the stern extension of this deck, it is possible to place the tender that can be moved using a special mini crane. For further information: Numarine Denizcilik; Gebze Plastikçiler Sanayi Inönü Mahallesi, Balçik Yolu; Gebze 41400 Istanbul; Turkey; tel. +90(262) 7510682; fax +90(262) 7510691; web site www.numarine.com; e mail info@numarine.com. Designer: Tommaso Spadolini and Can Yalman.